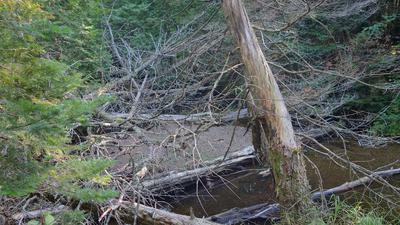 I can't say I've had great luck fishing in the Adirondacks of upstate New York. I've fished there perhaps 8 or 10 times, often in the cold season when fishing is closed in Quebec, but also in the high season. I try to get away from people when I fish so I haven't fished the popular and highly stocked sections of the Ausable or Saranac rivers. Maybe that explains my bad luck. Still, I get the feeling I'm a better fisherman than my Adirondacks record would indicate (self delusion?). I haven't fished enough this summer but this weekend presented the perfect window of opportunity. Oh, where to go? It's been awfully hot in eastern North America (July was the hottest month on record, since 1880, according to NASA's earth observatory) and this weekend's forecast was for 30-32 deg C temps. Sorry, 90 deg F.
The only logical choice was to head for the cool high peaks and track the mythical native brookies of the Adirondack mountains. The choice was correct but my logistics were not. I was to hike 15 or so miles to a largish river, and put my TB 36 to good use. Unfortunately there were several delays, one of which was stopping to fish in a small brook on the side of the hiking trail. 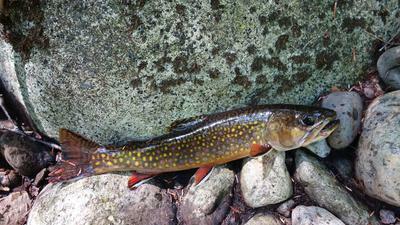 The brookies were so abundant that I couldn't stop fishing!. When I finally extracted myself and hiked another 5 miles downstream the sun was setting. I set up camp and realized that if I made it my destination the next day (1.5 hrs of hiking) I would only have a couple of hours of fishing before having to hike back out. The next morning I decided to change my plan. I would simply back track, but instead of following the hiking path I would walk upstream of the small brook (which shall remain nameless) and wet wade my way back to the trailhead. I still consider myself a neophyte when it comes to fishing so I try to learn a valuable lesson every time I go out. The lessons this time was "it's not because one section of a stream is productive that the entire stream will be productive". I bushwacked my way upstream for hours with very limited success. I was questioning everything. Is it the time of day? The type of fly? Am I not discreet enough? This went on for hours. Finally the topography got steeper and there were more stones on the streambed and it became truly freestone. That's when the beautifully colored brookies appeared. One after another they darted for my fly. All of a sudden the type of fly did not matter, presentation wasn't even that important and they did not care that it was fully mid day. Most any plunge pool more than 6 inches deep had a fish hidden under a rock but once I caught one fish, I rarely caught another in the same pool. They also spit out a fly faster than I could blink. Once bitten twice shy. No worries, I would just move onto the next hole. One pool however was different. It was slightly larger and I could tell the water was deeper than usual. I cast my killer bug and got a take but could not hook it. However I felt the heft and knew that the king of this pool was not like the others. I had to try again. On the third cast the big bully struck again I got the behemoth out. Eleven inches of high peaks muscle! I lost at least 15 flies to the trees and my legs look like they lost a fight to a heard of cats from srcambling over the dead fall but the water was wonderfully cool and it was my best fishing of the summer. A word on the TB 36. I'm no rod expert and I haven't tried a ton of them but I must give kudos to this fine rod. It really does cast weighted flies well and it also casts two flies well. When I tried two flies on my softer rod (Oni type I) they inevitably ended up in a knotted mess. It's also a strong rod. This summer I fished smallmouth bass with it. I only had #5 tippet and these hefty bass broke off too often. Annoyed with this situation I tied a section of my son's 5 lbs test as a tippet. This time if the fish gets away it's because the rod will be broken I thought to myself. No such thing happened and I caught several very hefty bass. I'm pleasantly surprised at the size of fish this rod can pull in. 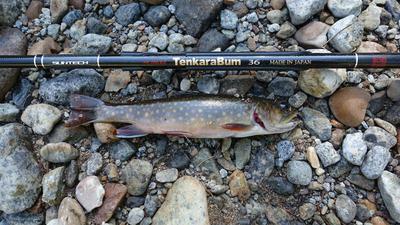 It may not present a #22 dry as delicately as my Oni but it is a wonderfull nymphing rod and a superb all rounder. I find myself using it more than any other rod I own. Well done Chris and Suntech. Thoroughly enjoyable read. Thanks for sharing your trip with us! I'm glad you liked it Terry, tight lines!